Residents of Soto celebrated Thursday evening, as a “frank and honest discussion” about identity completely solved all of the structural inequalities plaguing American society in their infinite intricacy. What began as an innocent discussion about Colin Kaepernick and the nature of American patriotism soon morphed into a full-on discourse about race, class, and gender in America that successfully addressed every nuance of American life and culture. While not everyone in the dorm participated in the rapport, word of the open and welcoming nature of the conversation spread across the dorm, and thus the solution to racism was disseminated out into the general population. 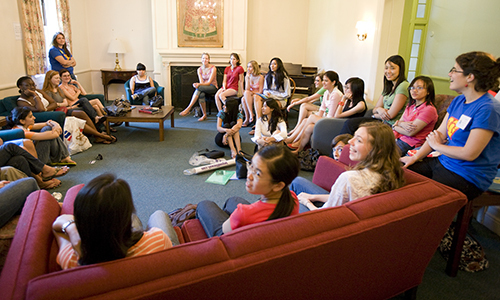 “When the RA’s sent out an email saying that we were going to have an open discussion about race, I had my doubts” reported freshman Terry Gill later, “but once we started it became clear that with so many viewpoints, backgrounds, and equally valid yet differing opinions, it would be impossible not to come up with a solution right then and there!” Reports indicate that there was even an international student participating in the conversation, although there are conflicting testimonies as to whether he was French, Saudi, or something else entirely. The conversation went on for an efficient hour and a half, and only ended when everyone was in complete agreement on all points, at which time the students adjourned for a game of pickup frisbee on Wilbur field.